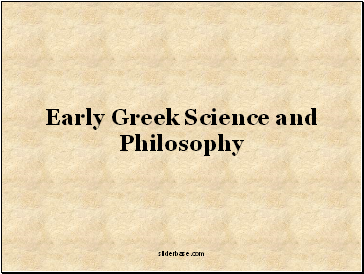 "In its early days philosophy included science – which became known as 'natural philosophy'. 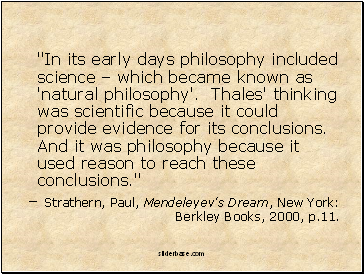 Thales' thinking was scientific because it could provide evidence for its conclusions. 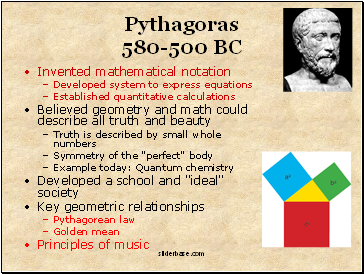 And it was philosophy because it used reason to reach these conclusions." – Strathern, Paul, Mendeleyev's Dream, New York: Berkley Books, 2000, p.11. 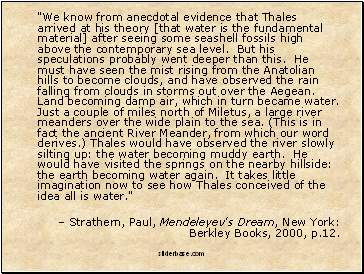 "We know from anecdotal evidence that Thales arrived at his theory [that water is the fundamental material] after seeing some seashell fossils high above the contemporary sea level. But his speculations probably went deeper than this. 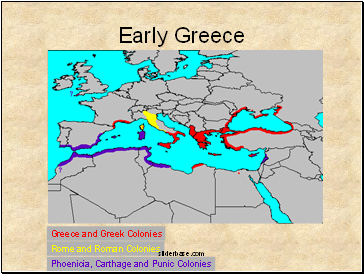 He must have seen the mist rising from the Anatolian hills to become clouds, and have observed the rain falling from clouds in storms out over the Aegean. Land becoming damp air, which in turn became water. Just a couple of miles north of Miletus, a large river meanders over the wide plain to the sea. (This is in fact the ancient River Meander, from which our word derives.) 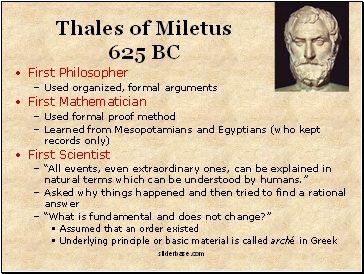 Thales would have observed the river slowly silting up: the water becoming muddy earth. He would have visited the springs on the nearby hillside: the earth becoming water again. 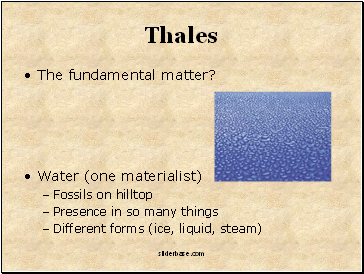 It takes little imagination now to see how Thales conceived of the idea all is water." – Strathern, Paul, Mendeleyev's Dream, New York: Berkley Books, 2000, p.12.